And the goodies just keep coming. What is it with all the celebrity gear on eBay this month? With an Yngwie-scalloped, original 1962 neck (arrrgghh!) on a '94 body, the seller claims "this guitar was one of his favorites that he heavily used throughout the 1990's on world tours as well as in the recording studio." 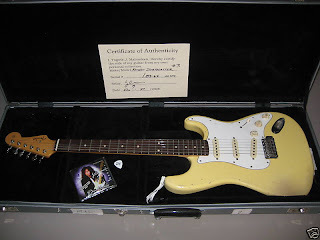 Yngwie's cherished #1 guitar, the famous 'Play Loud' Strat, was painstakingly replicated and issued by the Fender Custom Shop as the Malmsteen Tribute last year. Interestingly, the Tribute lists for $12,500 at Wildwood Guitars. This #3, an original, is more of a bargain if you ask me, at just under $30k. Check Out More Yngwie DVDs Here! I am so happy that Fender continues to manufacture an electric guitar with a scalloped fretboard. I recently posted about the most expensive electric guitars, and the Malmsteen Tribute made the list. You can read more about it here. Ridiculously priced, if you ask me.. I like scalloped fingerboards -- like playing on air. The only problem is the look of expectation you get from other guitarists who immediately want to see some shred arpeggios. This guitar is a FAKE! I sent the seller several messages on ebay explaining the guitar. It's obviously a Japanese Fender, and has ALL of the details that make such a claim accurate. As with any purchase on eBay -- Caveat Emptor! If I was buying this guitar I would pay a few extra bucks to have the guitar authenticated. this guy has been selling yngwie's guitars for a while on ebay. He aquired 4 or 5 of them in the deal with the ferrari. Yngwie's people are very active on the net so if this were fake you can bet your a$$ that this listing would have been removed and this guys account terminated. Not to mention he lives within 20 miles of Yngwie so you could always stroll over to the studio to show Yngwie what you just bought. He sold a lot of his stuff when he was having money problems years ago thats why he plays the crappy sig models like crazy. 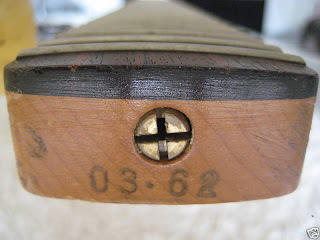 The seller seems to be claiming that this is a real Fender neck from 1962. If it was, the bottom of the fretboard would pass through the the truss rod about 20% down from the top. 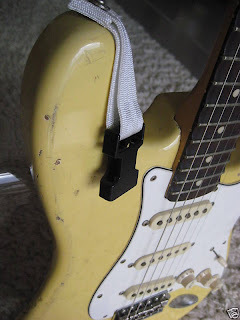 this is not a real vintage neck.